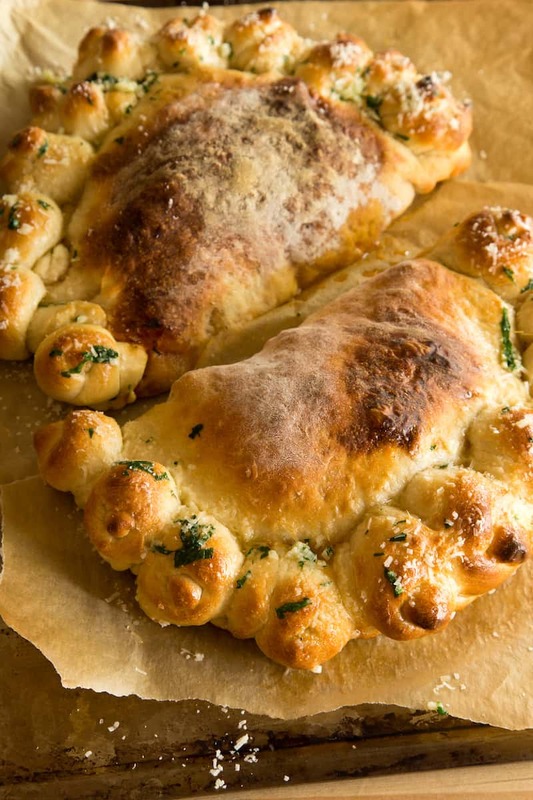 Stuffed Garlic Knot Calzones | Good. Food. Stories. Has anyone done a comprehensive study on how your sense of humor changes after you’ve been in a relationship with someone for a really long time? Like, is there a sine curve for how low the bar can go on inside jokes with your spouse after more than a decade together? This is not a good joke. But somehow the continued existence of Pizza Hut provides constant fodder for discussion in our household. No matter how repellent the new special, limited-edition, supersize item they’re rolling out, the Hut becomes a touchpoint for Dan and I to make constant facetious commentary about that’s what we really want for dinner, how that should be the highlight of our weekend plans, etc etc. It’s so lame. I can’t condone it. But it happens. I admit, we were seduced by the Hut’s promises when the pretzel crust came out, but after the (unsurprising) disappointment of the product, I swore that the “fool me once” rule was in full effect and I’d never be so weak again. So when the garlic knot stuffed crust was unleashed on the world, I was not swayed. I was not tempted. I was just going to make it myself. But instead of a plain old pizza, a calzone seems better suited to the doughy charms of a garlic knot crust. With a more even overall dough distribution, a calzone is a better architectural strategy. It lets you stuff in more cheese, sauce, and ingredients without collapsing under the weight of itself, and is more sturdily situated for scooping up said ingredients with the knots. With a pizza, you’re facing off with essentially two different meal approaches: the knot and the slice. With a calzone, they’re handily integrated into one. 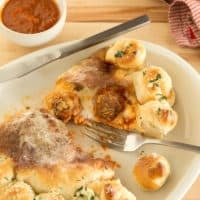 With my easy, beer-infused pizza dough recipe, you can make two big old garlic knot calzones that feed a family or a casual dinner party, or freeze half the dough and make two mini calzones that put personal pan pizzas to shame. See, it appears that you can, in fact, out-pizza the Hut. Burn! Preheat the oven to 450 degrees. Cut 1 piece of parchment paper to fit a large baking sheet. Place the baking sheet in the oven to preheat, but leave the parchment paper on the counter. Divide the pizza dough into 4 pieces of equal size. On a floured work surface, stretch and roll 2 of the dough pieces into 12- to 14-inch circles. Reserve the remaining 2 pieces for the garlic knots. Dollop the ricotta cheese in spoonfuls across half of each of the dough rounds, then divide the marinara sauce equally over the ricotta. Top with the mozzarella and any other add-ins you're bringing to the calzone party. 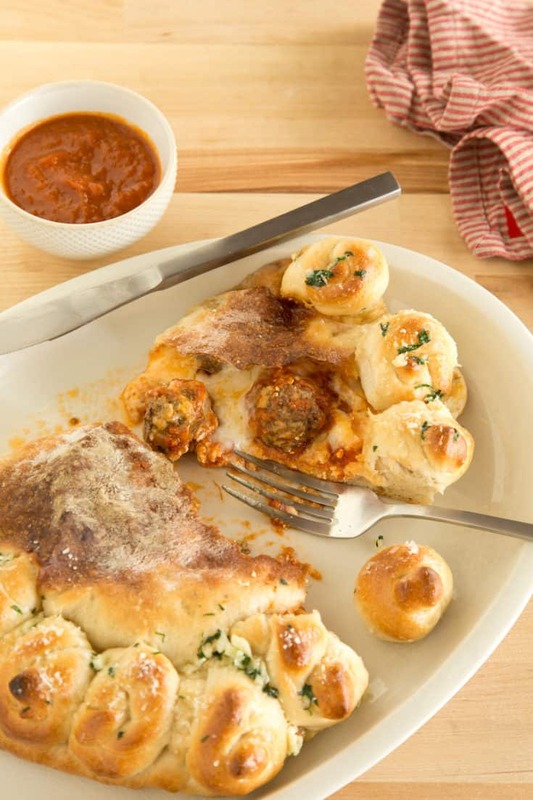 For the photographed calzones, I did mini meatballs, but it's really up to you. Fold the un-topped half of the dough over the toppings and firmly press the edges of the dough to seal into a traditional semicircle shape. Divide 1 of the remaining dough pieces into 10 equally-sized blobs. 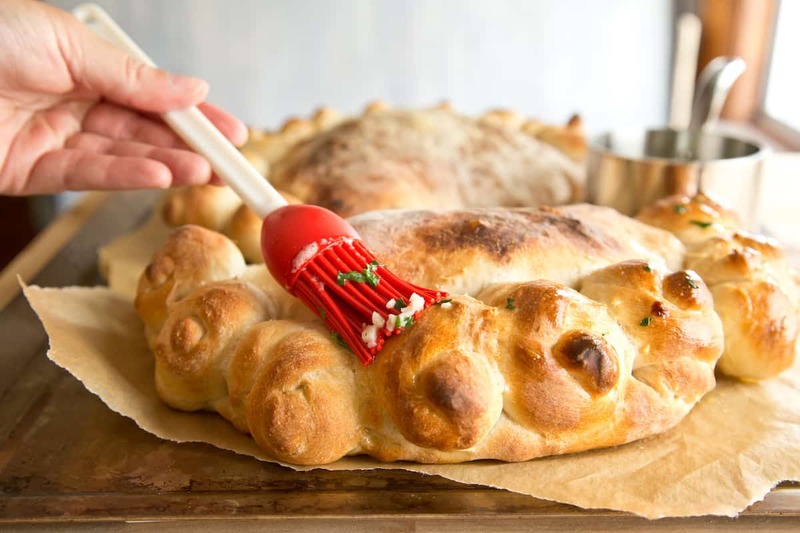 Press each of the knots around the edge of the calzone to make a border; if there are extra edge bits of dough that you want to cut off with a knife and turn into extra knots, go right ahead! Repeat with the remaining dough to finish the second calzone. With oven mitts, remove the preheated baking sheet from the oven and carefully slide the parchment onto the baking sheet. Bake for 20-30 minutes, until the calzones are deeply golden brown. While the calzones bake, melt 2 tablespoons of the butter in a small saucepan over medium-low heat, then add the garlic. Cook for 1 minute until the garlic is aromatic and starting to soften, but isn't browning or burning. Add the remaining butter and cook until all the butter is melted. Remove from the heat and stir in the parsley. Brush the garlic-parsley butter over the knots (and, heck, over the rest of the calzone if you want, or serve in bowls on the side for dipping. Sprinkle the calzones with Parmesan cheese. Grab a knife, fork, and fingers, and dig in! 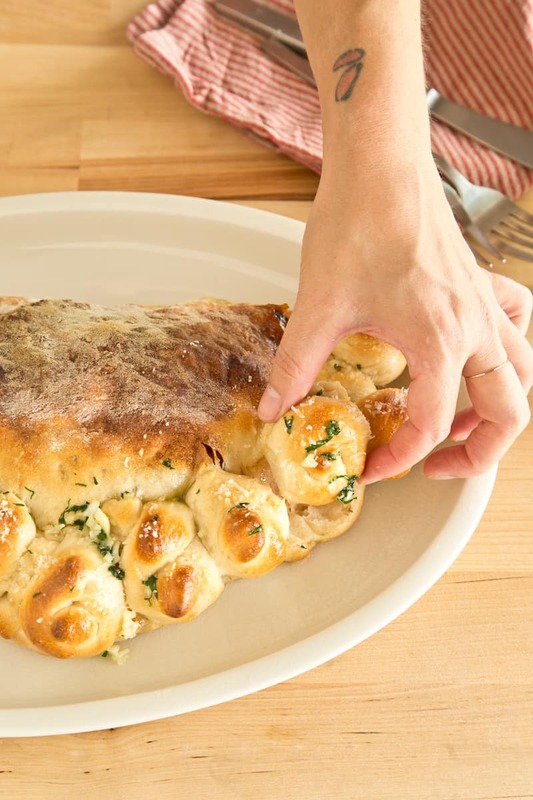 Pull the garlic knots off to eat and go crazy.